Organizers of Seattle’s Tent City 3 are passionate about what they do, but they hope their jobs won’t last forever. The Seattle Housing and Resource Effort (SHARE) was launched back in 1990 when a group of homeless people gathered “to assert themselves in a positive way,” banding together to unify a voice for those living on the streets. “We govern ourselves; we enforce the rules,” said Tent City 3 member Francis, who asked that his last name not be published. True to its roots, SHARE is still run by homeless and formerly-homeless people throughout King County. The organization’s goal is to provide immediate shelter for all people in the Seattle area, and to act as a catalyst for the homeless to return to normal housing. According to SHARE advocates, the tent city has proven to be an effective way to provide urgent shelter, especially when winter shelters close down annually in early April, sending hundreds more homeless back out on the streets. “Tent cities provide a safe place to leave your belongings, flexible hours for workers and the ability for couples to stay together,” SHARE reports on its website. Seattle’s first tent city, named Tent City 1, was erected behind the Kingdome in 1990. The encampment’s first night boasted two tents and 12 people, but within the week the number of residents grew to 125. Tent City 1 was dismantled when the City of Seattle moved the residents to an emergency shelter across from the Seattle Center. The needs of the often-invisible homeless became more evident to the public in 1997 and 1998, when three homeless women were murdered in the “Jungle”—an unofficial tent city in a wooded area of Beacon Hill. Reports of the murders sparked a campaign for a safer tent community. As a result, Tent City 2 was set up on city property near the Beacon Hill Reservoir. According to Share, the mayor agreed not to arrest the residents right away, but sent police two weeks later to remove the tent city. In response, SHARE/WHEEL moved quickly to set up another camp below Jose Rizal Park, also in Beacon Hill. That refuge for the homeless was bulldozed a little more than a week later. Yet SHARE/WHEEL refused to abandon its quest to provide housing for the homeless. In 2000, El Centro de la Raza, a Latino nonprofit organization focusing on community work, offered to host Tent City 3 in its parking lot. 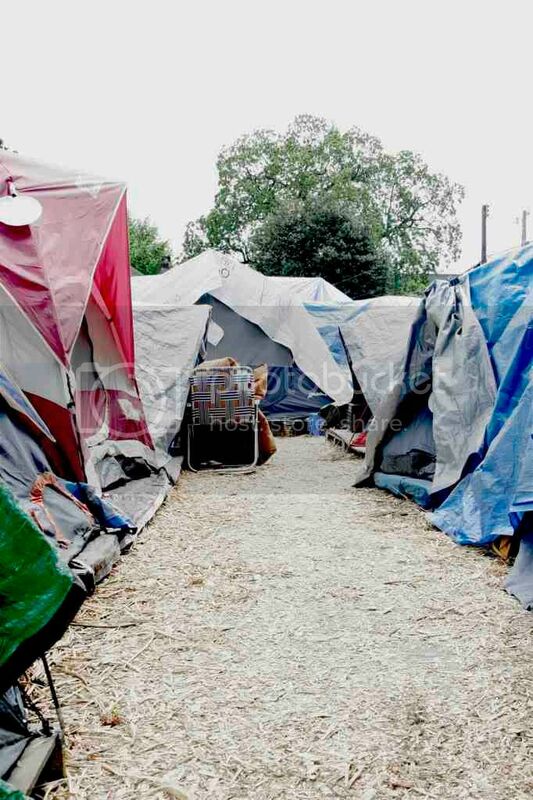 After the City of Seattle denied the organization a temporary-stay permit, the city fined El Centro more than $14,000 for refusing to disband the camp for six months. In response, SHARE, along with El Centro, filed a lawsuit against the City of Seattle. The nonprofits were able to avoid hefty fees when the two parties settled on a consent decree, which now governs the actions of Tent City. “That consent decree is really the only involvement Seattle has with Tent City, and that decree is what allows it to operate within city limits without being challenged,” Poole said. The consent decree does more than just allows Tent City 3 to legally reside in Seattle. The decree also provides a code of conduct that must be followed by all Tent City residents. Failure to enforce rules would result in a void of the consent, and permanent shutdown of the encampment. One of the rules outlined in the consent decree stipulates that the tent city must move locations every 90 days. Today, Tent City 3 rotates between Seattle, Shoreline, Tukwila and unincorporated King County. Currently, Tent City 3 resides on property at Cherry Hill Baptist Church near the Central District of Seattle. It is currently at full capacity with 100 residents, Johnson said. Today the City of Seattle does not fund any Tent City expenditures, Poole said, but Seattle does help fund the city’s stationary shelters also run by SHARE/WHEEL.